I was on a mini-vacation at the end of last week and "missed" the unveiling of the free Far Away Land Quickstart Rules. 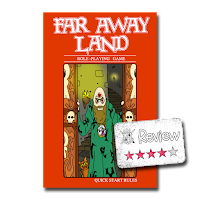 Far Away Land uses (some) similar mechanics to the free Lunch Box Heroes game Matt Jackson and I put together last year, but the similarities end pretty damned quick. FAL uses a d6 (as d2's, d3's and d6's) mechanic, some simple rules, and a lot of GM & player flexibility. I've been saving my pennies and nickles to buy me a copy of this game. It's been on sale for some time and it would be a shame not to get a printed copy as opposed to a PDF. Now I'm usually a fan of PDF gaming resources, but there is a lot of great colors and art in this game reminiscent of Adventure Time, but distinctly different. This great art has it's place in the soft/hard cover editions of the full game, but I think it is a detraction for the Quickstart Rules. The PDF is sized 5.5" x 8.5", which looks pretty good on a tablet, but just begs to be printed out. For something that is basically a teaser for the rules of a game (ideally used once then tossed aside when you buy the full game) I'd have appreciated black and white graphics, preferably line art. I don't think it would have detracted from the overall appearance any. The PDF is 33 pages, which is an odd amount considering if you did print it out you could go booklet printing and get this on eight pages of paper easy if you skip the last page which is just a solid red with the publishers small logo at the bottom. I'd have preferred the full-color cover followed by the black & white line art cover so I could just print pages 2-33 in booklet form and be done with it. At first I wasn't entirely thrilled that the sample adventure included was part of the Quickstart, but that was because I was in the mindset that you'd print off one of these for every player and the GM. 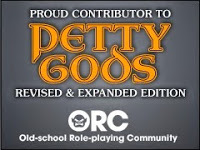 After reading the rules I think the average group could get by with a single copy and maybe print off an extra sheet or two as needed, like the equipment or spells pages. There is a PC sheet too, but I preferred to go to the FAL website to get the PDF-fillable version. I'm hoping to be able to run some PCs through the included adventure, "Isle of the Rat Wizard" not the next game session, but the one after that when we are down a player. I'll do a quick update after that session.